As soon as the weather cools off and we can tolerate having the stove or oven on inside, I make at least one one-pot meal a week. Big recipes that can sit simmering on the stove feed us throughout the week and completely slay the What am I doing for dinner? dilemma. These meals (and I have a lot of them) are especially great on, say, rainy Mondays when you have a ton of work to do and you're home with the kiddo. Remember that Punjabi Aloo Matar? This weekend I made a big pot of chili on Sunday night that has already saved me once today. I love this chili recipe. The ingredients are simple, the flavors are complex, and it only takes 20 minutes to throw together - 15 minutes if you're stronger than the leaky mess I become when faced with chopping onions. I leave out the beans to accommodate sensitive bellies, and add sweet potatoes to pack in the nutrients. 1. In a large heavy pot over medium heat, sauté garlic and onions in 1 tbsp of coconut oil until the onion begins to sweat. Add peppers and continue to stir until the peppers begin to soften (about 3 minutes). Transfer the garlic, onions, and peppers to a bowl and set aside. 2. Add the remaining tablespoon of coconut oil to the pot and brown the ground turkey. 3. Once the turkey is browned, return the vegetables to the pot and stir together. Then add the chili powder, cocoa powder, brown sugar, salt, white pepper, black pepper, crushed red pepper, cayenne, and paprika, mixing thoroughly. 4. Add the cubed sweet potatoes and broth. Place a lid on the pot and simmer on medium heat until the sweet potatoes are soft, about 15-20 minutes. Continue to simmer uncovered to evaporate excess liquid until the chili thickens like a gravy, about 30 more minutes. 5. Once it's the right consistency, you can continue to simmer the chili on low with a lid on. The longer this cooks, the better it's going to be. 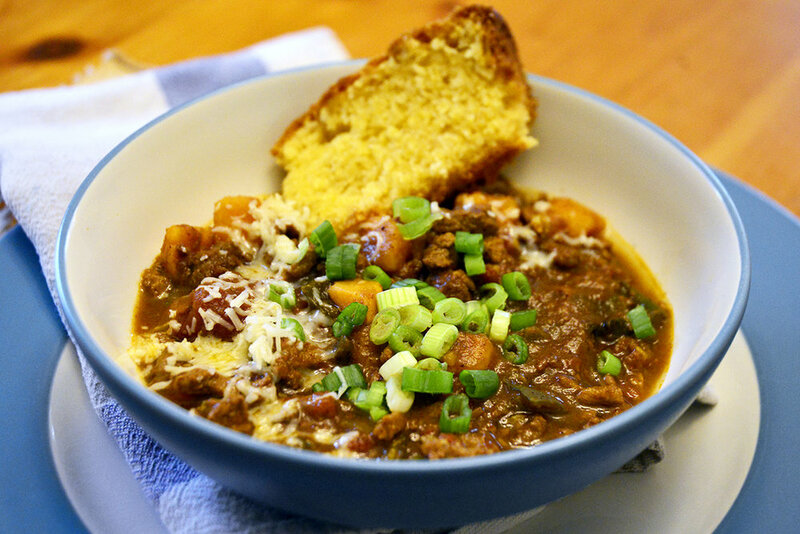 Serve it up with corn bread or corn chips, your favorite cheddar, and some green onions. Add a dollop of sour cream if you're feeling wild, (or greek yogurt for the more conservative types). Full disclosure: I had a bowl of this chili at 11 a.m. and it totally hit the spot. I am going to use daylight savings and a 5:30 a.m. wakeup as an excuse. Like what you see? I also work with lifestyle bloggers and restaurants. Contact me about food and beverage photography or digital marketing today. 1. I'm trying (really trying!) to take the take-out option off the table, especially for lunch. I don't need to be ordering enough food and shelling out the cash to meet a restaurant's $20 delivery minimum. 2. Even if I caved and ordered takeout, it would take 45 minutes to get here. After getting sad for a moment and then doing a quick mental inventory of the fridge, I realized that I at least had potatoes, frozen peas, and fresh ginger in the fridge. 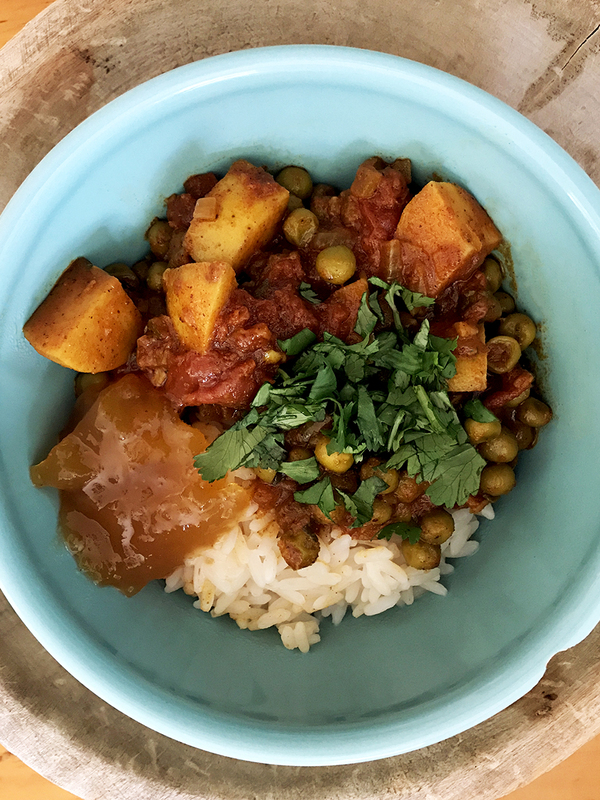 I google search followed by a rummage through the spice cabinet confirmed: I had what I needed to make aloo matar - a deliciously warming Punjabi dish of potato and peas cooked in a tomato-based sauce. For a long time I thought Indian dishes MUST be tough to make, if only because the flavors are so unlike anything I grew up eating. In reality, Indian cooking is actually a lot of one-pot dishes. Plus, once you buy the basic spices (most of which are used below), you'll have them ready to go for your next Indian cooking adventure. Not only did I have all of the ingredients, but the dish took less than ten minutes to prep, and another 15-20 to cook. Served with rice, some fresh cilantro, and mango chutney, the flavor was authentic, the cost was minimal, and the gratification was off the charts. Nothing beats homemade Indian food (except leftover homemade Indian food). 1. In a medium-sized dutch oven over medium heat, heat the coconut oil and mustard seeds until the mustard seeds are toasted (keep a lid mostly on the pot so the seeds don't pop out). 2. Add the red onion, ginger and garlic. Sauté until the onion begins to soften and the garlic and ginger are fragrant. 3. Add the tomatoes to the pot, first crushing them with a fork or your hands. Cook down until the liquid is mostly evaporated, about 5-7 minutes. 4. Add the chili powder, coriander, turmeric, cumin, garam masala, peas, potatoes and water. 5. Place the lid on the dutch oven and cook for 15-20 minutes until the potatoes are soft. I like to peek at 10 minutes to check the consistency. If it's too watery, cook the remaining 5-10 minutes uncovered. Serve over rice with mango chutney. I happened to have some chutney leftover from the last time my Indian craving hit (it's a problem), but Patak's Sweet Mango Chutney is sold in most grocery and a solid go-to if you don't have takeout leftovers in the fridge. Is leftover chutney in the fridge a thing for other people? Does anyone else eat this much Indian food?